Around 1910, the Mayor of Adelaide, Lewis Cohen, proposed erecting a statue of His Majesty King Edward VII, prompted mainly by the King’s sudden death. The cost of the statue, some £6000, was raised by public subscription before the war and the statue was practically completed when hostilities began. In 1918, the sculptor, Sir Bertram Mackennal, reported that all the full-scale models were complete and the granite pedestal was ready. Unfortunately all bronze foundries in England were contributing to the war effort and there was no hope of finishing the statue until the end of the war. The statue was erected some 10 years after the idea was first proposed. This fortunately allowed for its unveiling by the King’s grandson, the Prince of Wales, on July 15,1920, during his visit to South Australia. The Register of July 1920 recorded: “The most historically noteworthy of the numerous and varied engagements of the Prince of Wales in this state will take place today when his Royal Highness will unveil the statue erected on North Terrace in honour of his grandfather Edward VII.” The ceremony took place in front of what was described as one of the largest crowds Adelaide had ever seen. The paper commented that the statue was placed in front of a public building, the Institute, that had been reopened by the Prince’s father, George V, during his visit some 20 years before. The statue and its podium is 32 feet high and weighs 102 tons. It was dubbed by the paper the “finest memorial of its kind in the Commonwealth” . 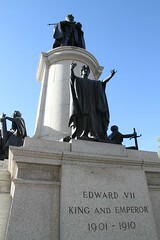 The sculptor’s concept was of the King on a pedestal in his coronation regalia. At the base of the pedestal there are three symbolic figures depicting South Australia, standing with her arms outstretched welcoming the world, together with the figures Peace and Justice. Sir Bertram Mackennal was born in Melbourne in 1863 and died in England in 1931. From 1878 to 1882, he studied at the National Gallery School in Melbourne under Frederick McCubbin and Tom Roberts. In 1882 he moved to England to assist the sculptor Marshall Wood but unfortunately Wood died shortly before his arrival. Mackennal stayed in England, studied at the Royal Academy School and travelled to Rome before setting up a studio in Paris. During his career he worked for Coalport Potteries and as an assistant to William Birnie Rhind in Edinburgh. Mackennal was knighted in 1921, and in 1922 was elected a full member of the Royal Academy. He worked with Sir Edwin Lutyens and was well known and popular in Australia, despite only brief and infrequent visits from London. He was a prolific and very talented sculptor whose works include panels for buildings (including Parliament House in Melbourne and Australia House in London), statues, war memorials, busts of the famous, figurines, coronation medals and coinage, equestrian monuments, and cenotaphs and tombs. His works are held in many Australian and English museums. Mackennal’s three equestrian sculptures of Edward VII (in Melbourne, Calcutta and London) are variations on a similar theme. The Adelaide work however, was quite different and is therefore particular to the City of Adelaide. Mackennal’s obituary in the Times in 1931 commented that he “was a classical realist with a strong decorative bent”. He was described as versatile and adaptable, and an excellent craftsman who produced an enormous amount in mainly marble and bronze. The memorial is historically significant as a reminder of the public's reverence for the British Royal Family, which continues to this day.